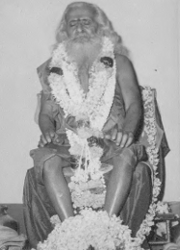 Guru: Sri Sri Shivaananda Saraswathi of Hrishikesh. Mahaasamaadhi: 05-04-1980, 9:30 AM, Chaitra Krishna Panchami. Bhaarta (India), the land of spirituality has given numerous saints, gurus and dharma pravathakas. It is believed that, the Almighty comes down to earth taking human form to lead the people to righteous life. Sri BHagawan Niranjanaanada Saraswathi is the avataar of Dattaatreya. Smt.Saraswathi and Parameshwara Sharma begot a son on being blessed for soma pradosha vrata. Unfortunately, Parameshwara Sharma left this world soon. The mother brought up her son with great difficulty. However, she ensured that the boy got all samskaaras timely as per the Hindu rituals. The young boy became a qualified doctor. He opened his clinic ‘Niroushadhaalaya’ at Chitradurga, Karnataka. People got cured of their chronic diseases with simple medicines and yoga, perhaps with his mystic powers. Time had come. The doctor in his prime youth bestowed with a strong body, submitted himself to his inner call to go spiritual. His well wishers and friends encouraged him to pursue a different life. He gave away all his worldly possessions to the needy and became a virakta. With the help of his friends, he reached Himalayas and chose Sri Sri Shivananda Saraswathi of ‘divine life society’ as his guru. He was given sanyaasa deeksha and named as Niranjanaananda Saraswathi. Sri Sri Naranjanaananda Saraswathi went for rigorous tapas and exposed himself to many odds. He was enlightened and given a direction by his Guru to move back to South and serve the society. Particularly, he embraced mouna, the silence for the rest of his life. Sri Sri Niranjanaananda Saraswathi started a new era at Mandya, known as Maandavya Kshetra., by establishing ‘Niranjana Kuteera’ in a piece of land donated by a farmer devotee. He became a loving Swamiji to all. Swamiji initiated spiritual guidance to his devotees. He gave a message ‘Pray and Live’ to everyone. He started uninterrupted prayer for 24*7 called as Akhanda Bhajana during auspicious days. He installed the idol of Lord Dattatreya and his own life size statue. He planted an Aoudumbara Vruksha. Now, all these have become the centre of devotion and power. Swamiji left Kuteera to Tekkolam (Tamilnadu). He did Suryapaasana, i.e, meditation by watching the Sun god with naked eyes constantly, in standing posture. It is believed that Yaagnavalkya Maharshi had done that. Whatever he experienced during his meditation got transformed into writing by him. It is known as ‘Dhyaana Minchu’ (Sun Salad). They are typical sonnet, combination of poetic beauty, spiritual message, philosophy with contemporary relevance. More than 4000 sonnets of Swamiji have been published by Sri Dattatreya Seva Trust®. Swamiji was a great musician, painter, sculptor and yoga expert, a combination of versatilities. On the request of his devotees, Swamiji returned but settled at Srirangapattana, a historical town on the banks of river Kaveri. Sri Krishnarao, an advocate provided Swamiji all that was needed by him. During his stay there, Swamiji used to give guidance and solace to many devotees, irrespective of caste, creed, gender, etc. He was the visible God to the devotees. Call came. Perhaps, the job assigned to him was executed. Swamiji left his eternal body to reach his place. But he is alive in his absence. A trust has been constituted by Swamiji on the desire of the devotees so as to manage the Kuteera. The trust has been celebrating all festivals duly initiated by Swamiji himself, like, Guru Poornima, Datta Jayanthi, Shivaraatri, Raama Navami, etc. Additionally, Swamiji Jayanthi and Aaradhana are being celebrated with grandeur. Thousands of devotees from all parts of the country take part in these celebrations. During Swamiji’s life-time and later too, the devotees have experienced numerous miracles. It is to believe that Swamiji did not go for any magic. But, the experiences of devotees have heralded the strength and powers of Swamiji. Hundreds of such beneficiaries are before us even today. At Niranjana Kuteera, daily pooja rituals are held meticulously. Emphasis is given Bhajana Marga instead of conventional rituals. Pooja followed by Bhajana and Aarati are being held at 8 AM, 12 noon and 8PM. A museum is maintained to exhibit the things used by Swamiji. The Beeja Mantram “Om dram Om Gurudattaya namaha”, coined by Swamiji is chanted everyday followed by Paahimam Niranjana, Trrahimaam Niranjana, another phrase of daily chanting. The devotees can stay at Kuteera. Nitya Prasadam is being provided. However, meticulous care is taken to maintain the spirituality and simplicity as per the guidance of Sri Swamiji.